We had a pretty laid back week considering how eventful our weekend was. Sunday was my husband and my ten year dating anniversary, so after church, we packed up our little guy and headed to Colorado for an afternoon out of our normal routine. Though I always say I will try a new restaurant every time we leave town, I always end up reverting back to an old favorite. If we are looking for fast(ish) food, it is always Mad Greens. And for sit down, which we did Sunday, it is BJ's Restaurant and Brewhouse. I cannot tell you how much I love their food! They have one of the best healthy lunch menus I have ever encountered. Which is saying a lot for a brewhouse! 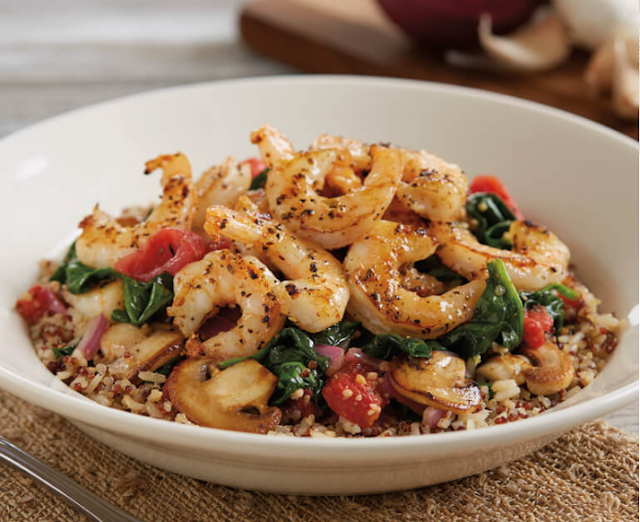 I had the Peruvian Quinoa Bowl and, let me tell you, it did not disappoint. I am now on a mission to recreate the recipe at home if it is the last thing I do. If you are curious about this awesome restaurant, check them out here. Though I would like to say we did some wild and fun romantic/family friendly excursion while we were out, I have to be honest. We ended up furniture window shopping. I know, we sound pretty lame, but if you know us at all you know that this is actually something we find very enjoyable. The only thing that would make it better is if we had plenty of money to buy whatever we wanted but, hey, we live within our means. This upcoming weekend is another special date as Sunday is my husband's birthday. We hope to spend it out and about either hiking, fishing, boating, or something more exciting than furniture shopping. I'll let you know. 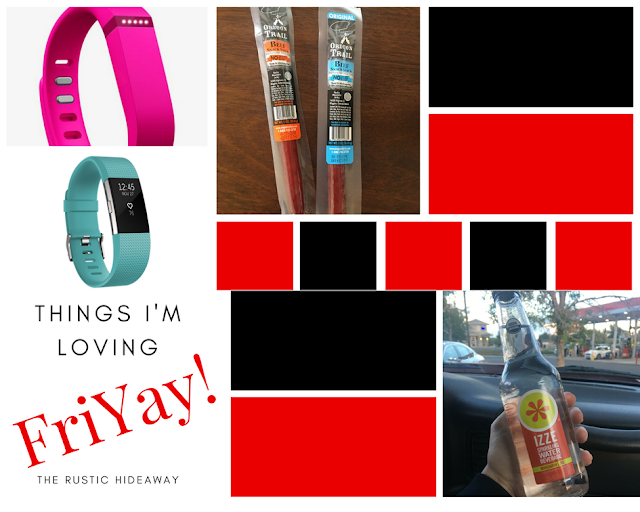 So, here you have it, this week's Things I'm Loving FriYay! Enjoy. I swore I wouldn't do it but, alas, I have found yet another amazing sparkling water drink. I just can't help myself! I am a mega water drinker and rarely get bored with the plain stuff, but sometimes you just want to mix it up a little. I found these babies while grocery shopping at our local King Soopers (Kroger) the other night. I am certain you can find them at any store that carries the brand or just click below! I had the Mandarine Lime flavored water and it was incredibly delicious. There are only ten calories per bottle and speaking of the bottle--it's glass, and fancy, and makes you feel like you are super high class, allowing you to forget that you bought it for a buck. My kind of drink. Pinkies out! My hubby brought these to my attention while grocery shopping so we decided to give them a try. I am a huge jerky fan and find it to be the perfect snack to get me through a workout or help pack on some extra protein in a day. Though I have to admit I was slightly put off at first taste due to a rather rubbery texture, they ended up tasting absolutely fantastic! They are a great on-the-go snack and soft enough for even my toddler to gnaw on. I will definitely be keeping these babies in the purse--AKA mom bag--from now on. I have been a part of the Fitbit Fanclub since I received my first one--the Flex--for Christmas 2014. I cannot express how much I love this brand. In fact, in the three years I have had my Flex and then this past year with my Charge 2, the only time I have not worn it was the week I was in the hospital having my son. No joke. I am a little addicted to knowing how many steps I get each day and trying to beat my personal bests. When I upgraded to the Charge 2 I was thoroughly surprised with how many additional features it had including heart rate, calories burnt, flights climbed, and even a relaxation setting. And, although I do miss the waterproof feature of my Flex, I did not have an issue getting used to taking this off before each shower. 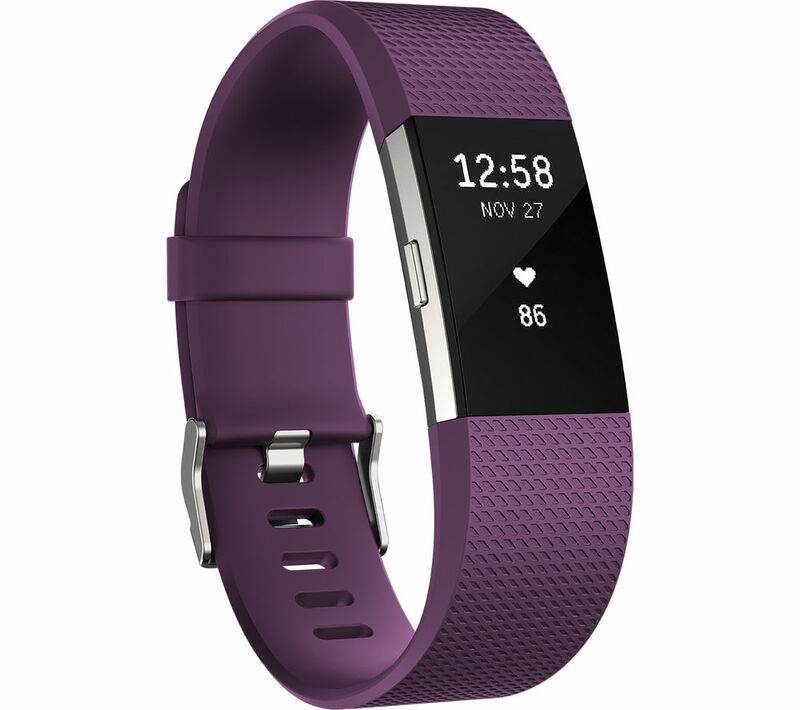 If you have a passion for fitness like I do I highly recommend any one of the Fitbit products. Though I will leave you with links for the two I have actually used and fallen in love with.